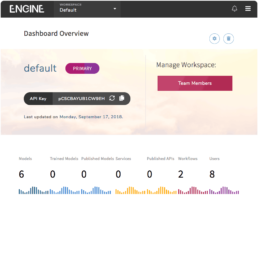 Engine AI suite has been designed with the business user at its core. Our tools have been designed to allow subject matter experts in organisations to create machine learning models on their data without the need for coding. Most importantly we don't seek to own any of the IP of models created with our tooling by our clients. Filament Engine Suite empowers your organisation to do more of what it’s good at, more quickly and more consistently through the power of AI. Humans are awesome. They make the success of your business possible, working tirelessly and carefully to make sure that your customers trust and value you and your products. Unfortunately, we’re not perfect. Accidents happen. Maybe the expert who can answer your question is on vacation. Maybe the new employee said the wrong thing because they couldn’t get a read on that tricky customer. AI is awesome too and just like humans, it has strengths and weaknesses. AI is consistent, reliable and never gets tired. It can read millions of documents in a day and will give the same answer at 9am or at 4:59pm. On the other hand, AI lacks creative thought and pragmatism natural to human employees. At Filament we believe that Humans + AI is the perfect complementary partnership of capabilities and tools. Filament Engine suite is designed to help your organisation to augment and optimise its existing workforce. We provide the tools you need to develop, train and deploy your own AI models in the cloud or your own infrastructure and plug them into your business processes. The system is designed to be used by non-machine-learning specialists to prototype, improve and deploy AI-powered business processes quickly and easily. A robust set of tools to ingest, clean and annotate natural language data ready for model creation. Train & continuously improve NLP Machine Learning models using user-friendly tooling & analytics. Publish trained models into a central hub, allowing other users across the business to access and use them. Integrate models built in the suite as well as other models/third party services outside of the suite into workflows to enhance existing business processes and applications. Creating an effective NLP machine learning model depends first and foremost on clean, relevant, structured natural language data. The NLP Data module supports a wide range of file types and can import data from multiple sources. We can seamlessly upload from cloud storage drives such as Google Drive, AWS S3 or use our custom connectors to enterprise platforms such as SharePoint and SalesForce. Once data has been ingested, tagging tools help us and our clients to create a well-structured, clean dataset for training. Our annotation tooling allows clients to securely invite a range of domain-knowledge experts to annotate the data for training and testing machine learning models. Engine’s smart optimisation system will automatically use the natural language data assets to find the optimal machine learning approach to solve your challenge. Start using your model seconds after clicking ‘Go’ and its performance will improve as the optimizer calculates the best algorithms and parameters to use behind the scenes. We have built in a combination of cutting edge ‘Deep Learning’ algorithms and widely used classical machine learning algorithms (Support Vector Machines, Random Decision Forests) to tune itself to the use case and provide the performance and accuracy needed to power business applications. 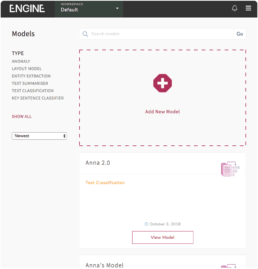 Use Engine’s Testing Console to view the performance of the model in terms of Accuracy, Precision and Recall. The Confusion Matrix helps to understand more about the model’s performance and allows you to re-train the model until you are happy, then publish to access and use it as an API. 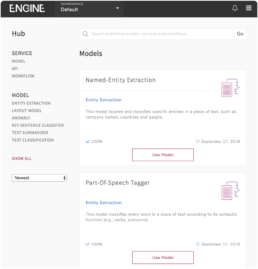 The Engine Hub is where the trained and published machine learning models are accessed. 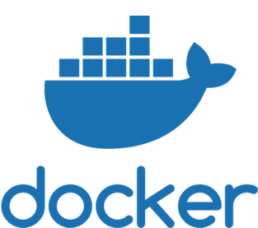 Each published model takes the form of a REST API for easy integration with other applications. Share models within your organisation or search for a model that someone else has created. 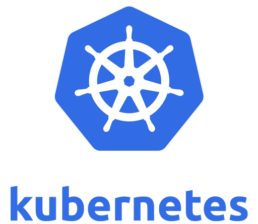 In addition to your own models trained on Engine, the Hub can also be the access point for models created by other vendors or by an internal team of data scientists. It’s easy to add external models into your Hub, as long as they have an API. So, if you have an API key from anywhere else - such as Google, Microsoft or IBM, use the simple form to add this to your Hub so that others can access it. 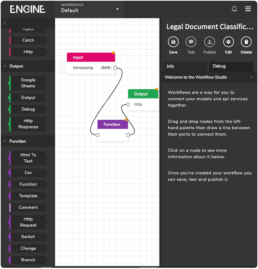 Engine Workflows allows teams to connect their machine models into business processes, applications, chatbots and more. 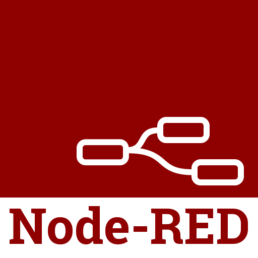 Using our customisable workflow UI (built on top of Node Red), teams are able to attach input and output Engine Suite nodes to external ML models as well as models built within the Engine Suite. This allows you to build workflows modelled on real business processes that can then be exposed as REST APIs in the Hub for integration with other applications. AI process automation can be applied to document-heavy parts of Finance. Natural language processing techniques can be applied to sift through thousands of commercial loan contracts in seconds, compared with the number of days it would take for lawyers and loan officers to review the contracts. Natural language processing (NLP) techniques such as entity extraction and text classification can be applied to drug discovery research. NLP can be used to extract value from unstructured text data, such as reported adverse side effects, by transforming it into actionable insight for R&D based decisions. Natural Language Processing (NLP) techniques can be used to help lawyers get consolidated answers to questions, instead of trawling through thousands of legal documents. It can also be used to track changes to relevant policies and government legislation. Machine Learning (ML) techniques can be used to identify opportunities to improve the sustainability of buildings. ML models can be trained on IoT data to suggest opportunities for cost and energy savings. The power of AI can be harnessed to automate customer service enquiries by routing customers to the relevant agent and routing prospects with buying intent directly to sales personnel, thereby improving customer satisfaction. Custom ML models can be used to make recommendations to wealth and financial advisors, enabling them to scale their expertise and increase client engagement. Investment recommendations can be personalised to clients and customised based on real-time market data. We're ready for a challenge.